Summer is over. Or is it? This will be a meandering piece about summer, with connections to reading, baseball, the calendar, kids, and the rhythms of life. My summer reading list, if it really existed at all, was phantom-like. Recent book grabs include one that presents three views on God’s will and decision making, a Duck Dynasty biography (couldn’t stand much! ), and a Stephen Colbert book (I wish he weren’t so caustically one-sided, because he’s genuinely funny). On my active shelf are a book on the history of words in religion, a history of the Silk Road, and two volumes on the kingship of God. This summer, I have read some poetry, a little on baseball, and a few pages each from Richard Hughes and Frederick Buechner, plus a few other things. Oh, and I’ve spent some time reading and studying an ancient, mid-length letter from Paul, including reading two paragraphs in Greek. Sounds like a lot of reading time, you say? Nah. I’m talking about a total of less than 10 hours there. Pitiful, I know. And the progress in writing my own next book has been precisely nil this summer. Roger Kahn’s The Boys of Summer, a book about the Brooklyn Dodgers, is legendary. My dad’s copy of that one remains where he would have seen it, high on a shelf in his/Mom’s study. On a lower bookshelf in our home sits Dad’s coffee-table-sized book that chronicles baseball’s summers of ’47-’57 in the lives of the three New York teams—the Dodgers, the Giants, and those dratted Yankees. The Dodgers and Giants moved to the West Coast in 1957, rendering summer fun permanently shut down for many. Our family enjoyed seeing the KC Royals with a friend in Kauffman Stadium last Saturday. It was a sticky, muggy, summer night, but it was not overly hot, especially after the sun was hidden behind the stadium on the third-base side. This summer is not a good one for the Royals, to say the least. It was a great game, though: the last-place Royals, the 2nd-worst team in baseball, beat the even worse Orioles in the 9th. Usually two or three times a summer, when I was a boy, my dad and I would go to the Vet to see Phillies games. There was one memorable, July 4th double header, at which a friend sat with Dad and me in the lowest seats, in straightaway center field, just above the outfield wall with the “408” painted on it in yellow. I’m not sure I’m creating memories like that for our son, but he has been to three Royals games, a Pirates game with cousins, and a Reds game before he could remember. He has also played baseball three summers in a row. According to his 2018 baseball season, summer lasted only about 6 weeks (May-June). For me, despite one serendipitous baseball game I saw on a nice Minnesota afternoon while traveling, this summer has been the worst on record. It is not over yet? For children, summer is almost always something to which to look forward. They often have summer camp experiences. Manatawny, a Christian camp in Southeastern PA, was the thing that we kids looked forward to most. My sisters’ kids all go to similar camps now, too, and they seem to feel the same heart-tugs, while experiencing similar growth of all kinds. Then there is marching band camp, and several of my sisters’ kids are now doing that annually, too. Summer is certainly not all bad for kids. For many, summer is over in the middle of August when school starts way too early. Two private colleges at which I’ve taught hold classes on Labor Day, having started a week or two previously. School always started the day after Labor Day when I grew up. According to just about every U.S. school calendar, summer is by now over for everyone. Jedd has had some great times this summer (for example, a children’s play, baseball, some travel, a lake, cousins, and swimming). Speaking of swimming … they drained the town pool weeks ago here, which seems pretty ridiculous since summer persists. The heat and humidity (or just heat, or just humidity, but rarely any relief) have been oppressive and unrelenting for so long, it seems. We had a cold winter with little snow for playing, an almost nonexistent spring, and then this beastly summer. We’ve had, what, six or seven nice days since June? Remember the TV show “In the Heat of the Night?” I never watched it, but I think it was based somewhat on the premise that crime heats up when the weather does the same. (When is it not hot in a Mississippi town?) I also recall an episode of M*A*S*H in which everyone’s nerves were frayed because of heat. Last Sunday night, in the summertime cool of a Lutheran church building, I heard the Midwest Chamber Ensemble, and their opening selection was a rare performance of a work by Arthur Honegger titled Pastoral d’Ete (Summer Pastorale). This piece shimmered and sang, and it led me to think of other summer-oriented art music. . . . I have a CD of summer wind quintet music that includes Barber’s Summer Music, Op. 31, a provocative piece written well for the medium. I return to this disc often, including a couple times this summer. Barber’s Knoxville: Summer of 1915 is not a favorite of mine. (Few and far between are the sopranos I would listen to on purpose.) Berlioz’s Nuits d’Ete (Summer Nights) is more pleasing, but still, it’s a soprano. So, no thanks. As Summer Was Just Beginning, a simple, tuneful, elegiac tribute to the late James Dean, enjoyed at least a decade’s worth of appreciation in the wind band world, but the piece’s fame is now approaching its winter. Frank Bridge’s tone poem Summer is simply wonderful. What glorious sounds! If I could rig some great speakers in a park, and if I could order a 70-degree, mosquito-less, summer night, I would sit out under a tree and listen to it again. I remember a few summer evenings on the grounds of the Mann Music Center, north of Philadelphia, hearing the Philadelphia Orchestra free or at greatly reduced cost, with good friends. And all these thoughts of music evoke pleasant, breezy, relaxed feelings. Was this what Jim Seals & Dash Crofts were singing about? “Summer Breeze makes me feel fine….”? My summer of ’18 has not been blessed by many of those feelings. So goodbye, summer of ’18. I’m done wid’ ya. I wish I could be assured that I’ll forget you, but I won’t be surprised if you haunt me. I wish I had seen and hiked in the Rockies this summer, but, failing that, come on, cooler weather and breezier, more chilled thoughts. Come on, fall concerts and crisp mornings with coffee on the deck. Maybe I’ll soon be able to walk 20 yards sans sweat or anxiety. Come on, Major League Baseball’s “Fall Classic.” Just come on, fall. For two extended periods in my personal history, Christian camping played a very important role in my spiritual and social life. I began my summer Christian camp experience as an eight-year-old at Camp Hunt, a fairly small camp in upstate New York. I was stomach-sick that week and had a bad time, transferring the next summer to a much closer camp with burgeoning loyalty. Camp Manatawny in Southeast PA always offered something to look forward to. From age 9 through 17, I annually spent a week there as a camper, and I also served a few weeks of my later years as a staff member (dish washer and counselor). In 1998-2001, I returned as an adult and counseled and led hymn sings and devotionals, forming some lasting relationships. My memories include cabin devotionals, hymn sings, campfires with equally rich silly and spiritual sides, and girlfriends. It was an athletic experience, too, actually: I have a few athletic awards to my credit, notably including placing in the softball accuracy throw and winning the push-ups event at least one year. I don’t think I ever placed higher than 4th in a track event. Manatawny and I parted ways (arguably its choice, not mine), but I still have many fond memories. I was pleased last year to learn a little of my nieces’ Christian camp experiences. They are growing similarly at other camps. Last year, my son Jedd went to a day camp at Camp Wyldewood and enjoyed himself. This year, baseball and a theater camp are filling the first half of the summer for him. At some point within the next year or two, I want to find a good camp at which he can grow relationally with God and with others. I want to start him fairly early, not waiting until the pre-teen or teen years for this important part of summer. Academic buildings, dorms, and fields, etc., are often named with the largest donor’s name. This practice has always bothered me a bit, feeling that the “money talks” principle could end up compromising academics. The problem becomes more acute when it’s a church room or building that’s named for an individual. I’m such a purist about this that I don’t even think church facilities should be named for one of the twelve apostles. Of course, this problem doesn’t occur when a Christian group owns no real estate. Keeping it simple is better. And living rooms are more homey and comfortable, too. Time was when more pro baseball stadiums were named for their teams (Dodger Stadium, Astrodome, Yankee Stadium, Tiger Stadium). A couple 1970s-built parks were named for their settings near rivers. These days (see complete list here), only three stadiums use their teams’ names, and the rest appear to have large corporate sponsors that presumably paid for naming rights. The ballparks now sport such names as Comerica, Miller, Citizens Bank, Minutemaid, and Target. Having some knowledge of the Kauffman Foundation’s work in the Kansas City area, I don’t mind that the Royals stadium is named Kauffman, but I end up doubting the philanthropy of major insurance companies and banking conglomerates. Incidentally, we’ve enjoyed one Royals game already and look forward to another. Kauffman is my second favorite stadium experience, just behind Pittsburgh’s PNC Park, but Kauffman is easier to get to. Kids’ baseball teams also have sponsors, and this scene is good for the community and for the kids. Personally, I’m glad that my son Jedd’s team is sponsored by the River Cities Credit Union and not by a denomination or para-church organization like one of the other teams is. I wouldn’t prefer to play a role in advertising for churchy business concerns. The mulberries have just about stopped attracting the birds, which probably spend half their time now nesting in diabetic comas. It is almost safe to park our cars in the driveway again. See Mrs. Shuck and the mulberry tree for the backstory. I’ve since learned that Mrs. Shuck did indeed have quite a Christian legacy, and that she passed from this life a year or two ago. Time was when a friend and I attended a few Philly Orchestra concerts at the Mann Music Center. One could often get cheap or free tickets to sit on the lawn. Good times. Summer sounds in eastern Kansas have so far involved raucous, sporadically nocturnal neighbors who don’t handle the clock or their booze very well. On the plus side, Jedd and I heard the Kansas City Symphony a few weeks ago, and I look forward to hearing a local jazz group and a children’s folk singer in July. And now for a cool sound that has nothing to do with hot summer. At some point while listening to this “Gumdrop” ringtone on my phone, I realized it included asymmetric meter.¹ I couldn’t resist writing it out. For us rhythm geeks, the fun is built into the 7/8 bar, which makes it seem like the repeat comes an eighth-note too early. Here is a recording, too. ¹ Since none of the first six WWW sources I found had a very good definition of “asymmetric meter,” here is my simple one: a unit or measure of music in which not all pulses (beats) have the same duration. As we approach the middle of the Major League Baseball season and the All-Star game (don’t get me started on the length of seasons — baseball’s is no more ridiculously long than hockey’s or basketball’s), here are some thoughts. . . .
29 home runs in 1919 — it was more than twice the number that anyone else hit. But Babe Ruth was not only a home run hitter. He also hit for average. This guy was multi-talented, and it’s almost galling (not unlike the case of Pete Rose, the all-time MLB hits leader who holds many records and squandered his reputation in more than one way. Why was so much talent given to guys like these?). Moreover, Babe Ruth was originally actually a pitcher for the Red Sox before being traded to the (deprecatory cough) Yankees in perhaps the most celebrated trade of the century. Stan Musial was another record-setter with multiple talents: 17 seasons > .300, record #s of triples, runs scored, total bases, 24 All-Star games, and more (source here … also see picture and the superimposed quote by a former MLB commissioner). Musial, unlike Ruth and Rose, was known until his death earlier this year as a gentleman, above reproach, and a “class act.” All these were players with multiple talents. Very oddly (or maybe not so oddly, given my background), thoughts of multi-talented baseball greats lead me to thoughts of church and preachers. Have you ever known a preacher who was active in leading worship? A small group minister who was also the youth minister? In the scores of a cappella churches in my experience, the preachers tend not to do too much at once — which I think is good. The staff ministers who can sing OK acceptably may lead worship in song occasionally, but almost always on Wednesdays nights, when they aren’t otherwise in the public eye. Rarely do they lead in congregational prayer. (Therefore, the pastoral “benediction” is virtually unheard of in RM CofC congregations.) This pattern, I think, is better than that in many other churches: it avoids at least some sense of leadership monopoly, whether or not the leader has multiple talents. I once drove 20 miles to congregate with others before a guitar-playing Lutheran cleric in Elkton, MD. (That was back in the days that I was more influenced by new styles, so I sought them out regularly.) He was multi-talented and was leading “contemporary worship.” I suppose he was a decent guy, too, because I see that he’s still at the same church — presumably no burnout and no scandal. But I wouldn’t likely go there today — too much power (even if innocently placed) in one person. In these latter days, whenever I encounter a “pastor” who leads communion and plans the mission effort and articulates a vision for the rest of the church and does most of the public praying and makes a bunch of announcements . . . I’m not overly impressed. Well, actually, I am — but not positively so, as I am when a baseball player can run, hit, and play the outfield like a puma. Multi-talented churchmen who monopolize public roles produce blights in the spiritual crop; churches that are more mutually based tend to produce a better harvest. Perhaps if salaries weren’t involved, church members wouldn’t feel it was warranted to “get their money’s worth” out of their staff by having them do everything. Really, we need an altogether new model. I am drawn to one that doesn’t have anyone at the mic or behind the lectern or on the stage . . . a simpler, more mutual, communal model. This paradigm, if it can be called that, is not well developed, nor is it time-tested, per se. Yet I think what I have in mind and heart makes more sense than anything I’ve read about (occurring in recent centuries, that is), and it gets closer to God’s original intent than anything I’ve seen in decades. Simple and pure and sans clutter — many are drawn to these ideas. I think this appeal is related to the draw that a friend my age (i.e., not old enough to have “lived” through them personally) recently felt toward a Peter, Paul, and Mary concert on PBS. That was simple music — easily accessed. Why not simple in Christian matters, as well as in pop music? As major league baseball season gets fully underway, I think briefly of the greatest sport’s stats-consciousness. There are stats, and meta-stats, and stats upon meta-stats. This feature of baseball can at once be endearing and irritating — sort of like color-commentators. Some of the stats are silly, like “first player ever wearing the number 40 to weigh 40 pounds more than he weighted in his rookie year, while stealing 40 bases in a season.” Others log bona fide accomplishments, like “hitting for the cycle,” batting over .300 for ten seasons in a row, pitching a no-hitter, committing no errors in an entire season, or winning the Triple Crown (for leading a league in batting average, hits, HRs, and RBIs). Another type of stat in baseball is the milestone — e.g., getting 3,000 hits, or 200 wins by pitchers. Speaking of stats . . . as I prepare to touch my toe to the 1000-blogpost milestone, I take a moment. A moment to think about the last five years — with 95% of the posts in the last four years, since the life-changing birth of our son. I’ve probably spent more time than I should have on blogging, and yet there have been times that I would have dried up emotionally and spiritually without this outlet. I’m thankful for it. I think of the countless edits — even the compulsive error-correction, that no one will ever know of, sometimes accomplished long after the publication of a post. I think of the handy WordPress app on my smartphone, allowing me to make minor edits and even write short posts there, if I choose. I think of the posts shared with others — those that have drawn new e-acquaintances, those that have challenged or annoyed friends whose faces I know, and those (probably most!) that have not been read by all that many folks. I think of the patient interest of my wife, who regularly reads and listens to so many thoughts from this blog. By the way, I’ve recently updated my brief bio/profile; if you’re interested in that, go here. Toward these worthy goals, I often challenge the status quo. I do not always do this well, but I do it with persistent conviction. I write about the church groups I visit for various reasons, and I write about the churches of my past. I write about things I hear from others who have been weaned on other traditions. I’m invigorated by writing about restoration of the ancient order. I’m periodically intrigued, or intolerant, or even incensed, always inclined to think out loud independently . . . but I’m never infallible. I write about doctrines that make sense, some that don’t make sense, and some that make partial sense. I write about denominations, certainly including the one of my own heritage, but I’m more interested than ever in nondenominational Christianity. I write about Calvinism and Romanism, which I consider involve many adulterations and hyperbolic excesses, although there are vestiges of truth in many places. 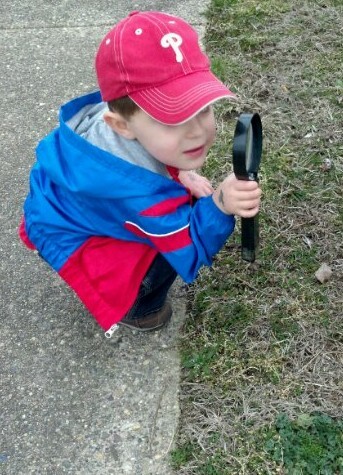 Like my son here, I believe pretty much everything deserves scrutiny and challenge for the sake of getting a better handle on it . . . and I think truth always outlasts honest investigation. And I write about Christian practice — both in the assembly and out. What Christian groups do when they are together can be the source of humor, inspiration, and frustration. The “Christian living” category deals some in repentant hindsight, in encouragement of purposeful living, and in general musings about trying to follow along as a disciple of Jesus. I’ve written less about the deeper concepts of worship than I would have expected, and I think this avoidance stems from having personally dwelt in worship less than in several other phases of life. Prayer has received only a modicum of focus, too; this is probably directly related to the fact that I often find prayer to be an inertia-stymied task. I have devoted much time to transcribing notes from group studies I have prepared, and to sharing notes from respected teachers and commentators. I have also focused largely on exegesis. It was no accident that one of the final posts leading up to #1000 was on exegesis. I believe that scripture-grounded Christianity is the only valid kind of Christianity — not for the purpose of worshiping the Bible, of course. The Bible is not an end itself, but in studying the ancient, well-attested writings, one uncovers more of God’s intent for the early Christian community. I grew up in a Bible-oriented congregation, and all but one church I’ve ever been a part of has paid serious attention to the scriptures on some level . 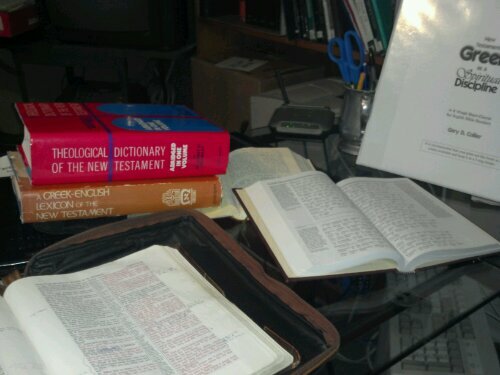 . . but I now find most of the “Bible study” of my past to have been lacking in depth. I advocate deeper, more intentional study, and I want to be both contextually responsible and devoted in my approach to biblical documents. Yes, there are other areas I’ve dealt in besides the above three — e.g., government and Christianity, and various rants about things like cell phone laws and the misplaced apostrophes of the world. I do have other interests and once even misused some summer hours devising a tongue-in-cheek “Shelter” for all my pet peeves. But the things that are most important to me have gotten the most attention. I like to call the important-stuff umbrella “Things of the Lord” or “Kingdom Matters.” Not only my blog categories and tags, but also my thoughts and my filing systems (although not my consistent life patterns) generally reflect this priority. God helping me, I will continue to 1) challenge the ways humans have messed up God’s intent for the Christian Way. And I will continue to 2) pursue the One God and His true worship. And I will continue to 3) study the scriptures seriously. Special note: in the next post, public post #1000, I’m going to attempt to bring these three, overarching topical areas together in one, and then I’m going to take somewhat of a break. Regular readers will hear from me less often; for a while, any bloggings will probably be either historical re-diggings or brief thoughts. I’m happy today that the latter half of this post was written by a guest writer I’m very close to — Karly Rose Casey. In some areas of life, looking backward nostalgically is pleasurable. In other areas, looking forward seems more appealing. As you consider the first two areas below, realize that they are short sections that will be of most interest to musician-readers. If you’re not interested in those, skip right ahead to the section my wife wrote! Palestrina was probably mostly a backward-thinker. Bach, as much as I hate to admit it, was probably more a forward-thinker. Mozart and Haydn seem to have dwelt more in their present than in the future. Dvorak and Mendelssohn seemed mostly content in past structures, infusing works with beauty that fit frameworks then current, or recently past. Liszt did some things with the past while decidedly moving forward. Debussy and Schönberg thought ahead (the former with more success than the latter!). Instrumental music structures in academia today In another area of musical life — the one in which I find my vocation — score study and rehearsal planning method “templates” are fairly standard. Most of us approach daily life in ensembles in the same vein: more or less, we study a score in certain ways, we prepare certain sections for the next rehearsal, and we lead our ensembles. In contrast to this standard model comes the creative thinking of Carolyn Barber, Director of Bands at the University of Nebraska at Lincoln. It’s outside my scope here to provide any of Barber’s details; suffice it to say that she is a forward thinker and an articulate, compelling leader. She inspires many by looking ahead methodologically and musically. Church values and practices. Ever notice that some churches seem to delight in being backward, while others seem to thrill to being ahead of the curve? The following thoughts on the church disparity are my wife’s. I appreciate her having gotten out of her comfort zone to write them, and I am delighted to post them here. I like antiques. The attraction to things of times past is somehow ingrained in me. I find value and some bits of wisdom in the way things used to be. Butter churns and wash boards are intriguing. However, I’ll keep my washing machine and I’ll make butter in the blender in 40 seconds if I want to. What about antique church? We visited a conservative² Mennonite church this past Sunday. Men and women sit on opposite sides, the women all wear head coverings (the majority are “Amish style”), the men all in white shirts and dark suits. The sermon focused on the value of the printed page which, to give the guy a bit of credit, was an interestingly unusual topic. His push to the congregation was to get each member to pass out 50 tracts a week. His stats told him that if every one of the 60+ members would meet the quota, that there would be 2,000 responses in a year. *sigh* Really??? Apparently, he/they are completely unaware of what it takes to reach people in the real world in the year 2013. I appreciate their simplicity, their sincerity, their steadfastness … but they’re like antiques. I dare you to tell any random woman that using a washboard instead of the modern washing machine is better because its simpler! OK, that’s not equal to differences in religion, but you get the point. Back up two weeks. We were in the gathering at The Journey church. They have electric guitars, people in jeans, and a coffee bar. Do they hand out tracts? No way. But people are flocking to them. Because they’re reinventing the way we “do” church so that people who don’t know Jesus will come looking . . . without having to worry about not “fitting in.” Try that in a church that requires head coverings. Now, it’s not impossible for people to come to know (or re-meet) the Savior in a “normal church”, but the rate at which that is happening compared to what The Journey is getting is pretty dramatic. “Meet people where they are” is cliché. But, as much as I shy away from it, it applies here. A guy with tattoos and spikey hair isn’t going to walk into a conservative Mennonite church looking for salvation. He isn’t. Nor is a single mom with two kids and a live-in boyfriend. It’s not going to happen. As a matter of fact, neither is likely to walk into ANY church building, because it’s uncomfortable. They feel inadequate. And/or they don’t see the need … maybe they think they’re doing “fine” as they are. People need Jesus. If they will come to a place where the preacher guy wears jeans and a bright plaid shirt, great; I’m all for it. Free coffee? Even better. Unconventional? A bit. And the next generation is depending on it. ¹ By the way, my childhood baseball hero’s birthday was two days ago, but I’m not even identifying him here, because he’s proven himself so unworthy of any more attention in this life that I don’t want to be the one to give him any more! ² “Conservative Mennonite” might also be known as “black bumper Mennonite,” as opposed to “color TV Mennonite” on the one side of the spectrum, and “Amish” on the other. This all began with commentary on the “Star Spangled Banner,” and it began on Facebook, not on WordPress. I was just blowing off steam, but the steam blew too high, and in too many directions. The meat analogies come today, at the end! I choose non-military and non-politically-involved ways to be a decent citizen and even to love our country and believe I have every logical and biblical right to do so. It wasn’t my intent to get into the nexus of war and Christianity on Facebook, but I guess I could! … Let’s put this junk aside, OK? Ok but ALOT of people have died and maimed for their country and this song is a rally point for them…. Peace brother! Thanks for the peace wish. I feel a little better. I would ask you now simply to remember that my comment was about the song and the immature … okay, *disrespectful* … performance of it. Although I do not value military service or sacrifice *for country* since those are not values I find in scripture, no disrespect for those who lost life was ever intended. Any anthem can, and probably will, become a rallying point, as you say, but that says more about the rallyers and their desire to rally than about the content of the song. I maintain that it was a bad idea to make that song the national anthem! Further commentary: the expression “rally point” set me off a bit, logically. It’s not as though the fact — and I do, by the way, take military veterans’ identifying in solidarity with the national anthem as a fact — has anything to do with whether or not military service is inherently justifiable, or whether such activity is approved for the Christian. How military veterans feel is simply how they feel, and how I feel is how I feel. The a priori existence of differing feelings doesn’t make some of them correct and the others incorrect. My summary would be this: whatever “rallying” occurs in the hearts of military veterans gives a nod to human bandwagon mentality, i.e., to the group of rallyers who wanted to rally, and to their affiliative feelings in said rallies, and to their philosophies and values–rather than to the relative logic or illogic of military service. The whole third stanza, for crying out loud and bleeding on the ground, says “You Brits got what was coming to you, and your blood washed your filthy footsteps since we beat you, you suckers.” I challenge you to defend that. And then I challenge you to praise God, in the same breath, as the next words of the song do, for His supposedly deciding to raise a human nation up above another human nation through war over a supposedly just cause (a thought from the fourth stanza … and we must ask just in whose eyes?). “Conquer we must” (also from the fourth stanza)? How far away from “Manifest Destiny” (and massacres and genocides in our land and others across the globe) is that? I am NO student of history, so I’m probably opening myself up to more verbal laceration here, but so be it. To call attention to watching over ramparts (whatever they are) to see gallantly streaming colors, I suppose, is fine. And there’s probably more to the general solidarity–suggested by the perennial, steady waving of the flag–than I have realized. I have never been inspired by the suggestion that glaring, red rockets and bombs are the events that define my country, and those lines distract me from what I now see is more the point of the first stanza—the query as to whether the flag is *still* waving over our land. For me, and this is just me, the “flag was still there” line is pretty unifying, but I wonder whether most people can even hear that line apart from the preceding warlike imagery, which is especially divisive in the current decade or three. I don’t want to move to North Korea, or Libya, or Croatia, so I won’t. I might like New Zealand or Switzerland or something else (having had the blessing of traveling abroad just a bit does expand one’s horizons, just as it makes one appreciate this country), but staying in the U.S. is OK by me. It’s a messed-up country, but it’s my country, and most of what it offers is better than what I know about most other countries. As I said earlier, I choose other ways to be a good citizen … but will never, as God gives me breath, pledge allegiance to a country over allegiance to God. Those with personal ties to the military will naturally have heartstrings that get tugged by positive, or negative, thoughts and suggestions about the military. Others without such ties may be influenced to have similar feelings. From a secular perspective, this is all fine and good. But these are preferences and choices and opinions, not absolutes. Everyone has a right to an opinion, for now, and all of our opinions will ultimately be enlightened, in the next life. I concluded by pointing out different ways I choose to love my country — including two American concert themes this fall, and loving travel experiences and sights in 48 states. If I’m wrong on any or all of the above. I’m simply wrong. Obviously, I don’t think I am, but if I am, it won’t be hard to accept in the light of the face of God, to be seen after this world, with all its beauties and its terrors, passes away. God’s will and His desires must continue to be the driving force for every believer. We will get things out of kilter, and we will err. Our responsibility is to be faithful to Him and His Kingship, as we have light and grace. Now for the meat analogies promised in the slug for this lengthy mini-series! The substance of our national anthem is questionable, at best. I speak here, primarily, both of its (entire set of) lyrics, and its vocal range. It is tainted meat to begin with, if not spoiled meat now. Why must major events choose pop artists to sing a song they can’t sing well? As my wife and a Colorado friend have pointed out in particular about the a cappella enterprise, it is not well served by people who can’t sing a) without amplification and reverb and such, and b) without loud bands backing them. Sports events, convocations, etc., hear me: if you insist on using the national anthem without accompaniment, you ought to choose a singer, or group of singers, or players, who can do the song justice without electronic aids. Way to go, Cardinals, by the way. A great American baseball town, and a downright-nice story, given the whole wild-card, comeback story of the season and post-season this year! This all began with commentary on the “Star Spangled Banner,” and it began on Facebook, not on WordPress. I was just blowing off steam, but the steam blew too high, and in too many directions. The meat analogies are to be saved for the end, by the way. What veterans in a veterans’ hospital might think of my statement or the national anthem is merely their opinion (not America’s as a whole). Mine, too, was merely an opinion. I don’t have to like the song, and you don’t have to like the fact that I don’t like it. But neither do you have the right to call a brother an idiot. My reply amounted to a rebuke, and its bold statement stems from my belief that Christian relationship transcends all others. In other words, no matter what the friend thought of my opinion, and no matter how wrong I might have been, he was in the wrong for calling me an idiot. This relates to my view on Christians and government, Christians and military, Christians and sports, Christians and entertainment, Christians and work … Christians and just about anything: essentially, in whatever sphere you’re thinking and operating, the Christian element or aspect must supersede all others. If a (perceived) conflict arises between philosophies, it’s no trouble for me to ditch the other one in favor of what I see as the Christian one. This is not to say that I enact these priorities perfectly. Far from it. But my human inability to be consistent does not change the reality. On some level, no matter how much one might disagree with my particulars, any Christian worth his salt will have to agree here. This über-significance of what one sees as God’s principles could be said to may be seen to might be analyzed as principles that must win out. Aside, but obviously related, if you think about it: are you aware that there are believers out there who question the Lutheran notion of sola scriptura (only scripture)? For centuries the Roman Catholic institution asserted its traditions and practices as superior to the Bible. Some examples: prayer to “saints” and to Mary, the immaculate conception (which refers to the supposed sinlessness of Mary herself), indulgences, the authority of popes, and infant baptism. If one finds human tradition to be on equal footing with scripture, lots of problems come into play; it’s a whole different ballgame! Oh, and we will get to the anthem and baseball, but not for a bit yet. Brian Casey … thinks the national anthem is a stupid song and isn’t sure why he gets upset when would-be singers butcher it at the World Series. You think our National Anthem is a stupid song? Sometimes you are an idiot, really. Gee. You must be having a day–sorry to have ticked you off, but yeah, I do think it’s a stupid song. It senselessly glorifies war and is vocally untenable; my opinion is that “America, the Beautiful” would have made a better national anthem. You’re right, of course, that a trained singer typically does it well. I would add that I’ve heard it sung with class and skill and artistry–and that a trained singer has more than an octave and a half of useful vocal range. I’m moderately vocally trained, as you know, and have almost that much range, but most people don’t. Maybe I’m off base on this, but I figure an anthem needs to be singable by “the people,” which is what makes something like “God Save the Queen” (is it the British anthem? I’m not even sure) a better choice, in my estimation. Haven’t you heard enough soloists butcher our song to agree at least with the suggestion that it’s not in the “doable” range of the common person? If not, maybe you haven’t heard enough of us non-vocalists recently! 🙂 Or, we can just disagree. P.S. Decided to take the plunge and read this, despite falling into one of the categories listed at the top? Not sure what there is to be upset about yet? Well, the musical stuff kinda stops here, and the controversial material begins tomorrow. These days, I look around me where I am, and I find a reasonable number of churches, but it’s hard to find a healthy one that shows signs of spiritual growth. The main story here is not the history of Christian conferences and events (shoot … there’s not even a stadium within 200 miles that could support a major Promise Keepers event … and no stadium to support the planned college baseball team, either, but that’s a story for another time). The MLB Commissioner’s Office has no counterpart, thankfully, in churches I’m directly associated with–no headquarters exists to meddle and make extra-biblical policy. Yet (oh, man–I think I’m about to speak counter to my nondenominational heart) the oversight of, for instance, the United Methodist Church hierarchy could be one reason there’s a Methodist church building in every little down around here. There seems to have been a plan to perpetuate a network and serve communities, almost regardless of size and population. As long as the rich get richer, the poor will probably stay poor. Dallas and Nashville and Atlanta churches will keep getting bigger until a) there’s a leadership scandal or b) Jesus returns; and rural congregations will, as a rule, stay poor. One would have to study a while to figure out why major metropolitan areas such as Baltimore and Houston have such pathetic baseball records. By rights, their economies should be able to support superstar salaries that spawn stellar records. Sometimes, mismanagement and bad luck may play a part in poor performance. This happens in churches, too! The Yankees and Phillies don’t deserve any more superstars, and the Bible Belt churches probably don’t deserve special favors, either. Hey, do I sound like a political liberal? I do struggle with capitalism a bit … on the one hand, it seems to me that those who work hard and make good business decisions should have be able to reap a few rewards, but on the other hand, I’m disgusted by the idea of the super-rich and believe they should bear more of the nation’s tax burden than they do. Both spiritually and economically, those who have a lot should, to some extent, help those who don’t have as much. How does the Major League Baseball Commissioner’s office relate to the Bible Belt? It may be a strained connection, but…. I know a few folks in Memphis and a bunch more in Nashville. I’ve wondered, on occasion, why Memphis doesn’t hav e a major league baseball team. Could it be because St. Louis is not far up-river, and the Cardinals have for many decades been one of the most worthy teams in all of fandom? The Cards have a good thing going, and another team 4.5 hours away probably wouldn’t have worked out so well. Then why not Nashville? Nashville is four hours east of Memphis and is another city of more than a half-million. Nashville somehow got a football team, but no baseball? I don’t get it. Maybe the legacy country music fans like football more? And what about Charlotte? It’s much larger, but maybe too close to Atlanta (once dubbed “America’s Team,” but the fans blew that one for me by perpetuating the “home of the “Braves” ending of the national anthem)? Cities like Milwaukee and Cleveland and Minneapolis don’t seem–by the size of the markets–to merit major league teams as much, and SF-Oakland certainly doesn’t deserve two teams. If you consider the mere pleasantries of the fan base legacy, or of a city itself, New York and Philadelphia don’t deserve any teams at all, but the smaller-market cities Kansas City and Pittsburgh do. Oklahoma City just might deserve a team, too. By some measures, Columbus is a bigger city than either Cincinnati or Cleveland, but the latter two got dibs decades ago. It’s about history more than population, I suppose. All the major conferences and events and lectureships and such are in the Bible Belt, too. Economically, I know, the Bible Belt churches can support a major conference, just like New York can support the most exorbitant of all the exorbitant baseball salaries (Yankee salaries, of course), but the Bible Belt is not where the conferences are needed. Just as the Royals need some quality players to lift them from the divisional basement, western Pennsylvania needs something to spur its growth. Central Kansas, too. Wisconsin. Oregon. West Virginia. I once suggested to a leader from an annual Christian conference that the organization should bring it to Delaware. Large populations from Baltimore, New York, Philadelphia, and D.C. would have access to it, and the comparatively diminutive Delaware churches could have been thrilled and edified beyond the norm. The conference leader looked at me for a few seconds. I don’t think the possibility really registered on him. I mean, everyone knows conferences are always in Nashville or Dallas. . . .
It’s essentially summer in my world. We don’t get much spring ’round here. I enjoyed coffee and a breakfast sandwich on the porch in the not-too-warm morning, but in a couple of hours, it will be too hot & sunny to sit outside. Sunday’s post was #715 on this blog. (This is a number with much better “karma” than 666, although that one was fun for a non-doomsaying quasi-exegete like me.) Some 37 summers ago, Hank Aaron hit home run #715 to break Babe Ruth’s record. The records of Aaron and Ruth–now #2 and #3 on the all-time list, respectively–are as yet un-besmirched by performance-enhancing drug use, so these are still records to ponder with nostalgic, admiringly unfettered smiles. Numbers and summers and baseball … this relationship seems altogether appropriate to mention since it’s summer now, and baseball is to fill 3 or 4 of our days this summer. We look forward to attending two major league games soon, and then a summer college players league game in Scio (Allegany Nitros), a minor league one, and then maybe another major league game in August. And we can’t forget the Fillmore Little League park just about 2 blocks from the house. Although it wasn’t so for several years, baseball is a good part of summer for me, and I’m happy to have it back, thanks to Time Warner Cable and various stadium opportunities. Karly read recently of some major league ticketed seats that include all-you-can-eat concessions. They can concede (why is it a “concession,” anyway?) all they want, but this fan won’t be buying those seats in order to eat more bad food, and I sho’ nuff (that’s southern for “certainly”) won’t be paying $5.00 for a single 20-oz. soda or a hot dog. I’ll be there for the baseball, and for watching my son watch baseball, not to pay through the nose for things I don’t need, anyway. Another part of summer is the things that grow and flower in this damp part of the world–wild lilacs and honeysuckle and the peach tree and the rhododendron outside our dining room window and raspberry bushes. Karly and I walked in the backyard last night around to sniff a few of these things, and to peek at the sliver moon through the pine trees. Nice. Summer can be nice.